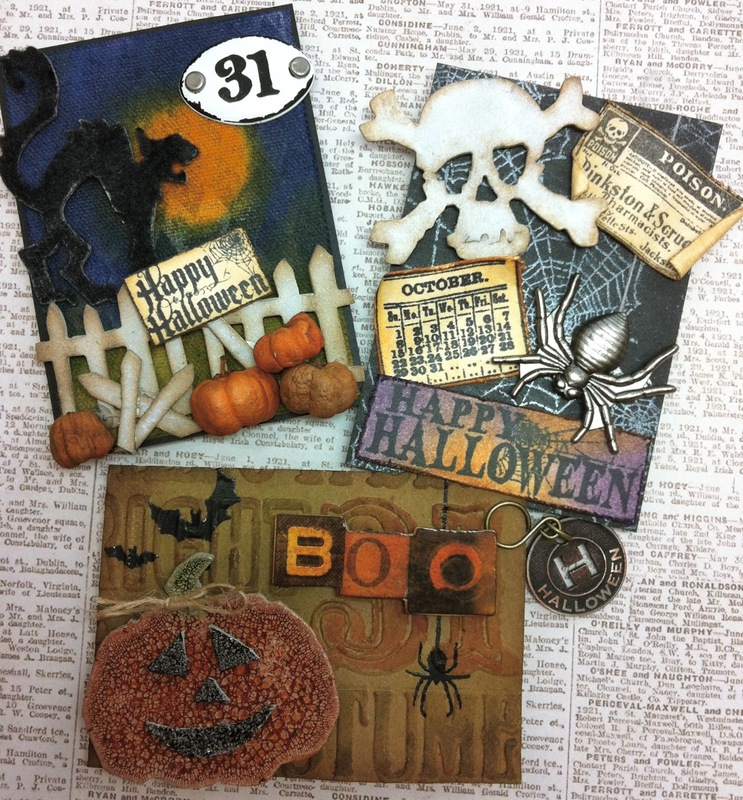 I hope you've all had a chance to do some creating with the new Tim Holtz products for the holidays. 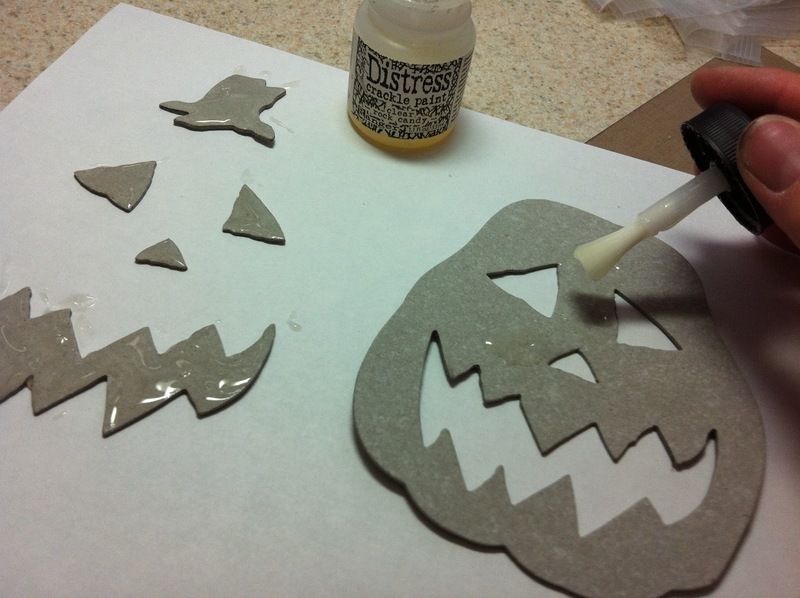 I have an upcoming classes you won't want to miss! 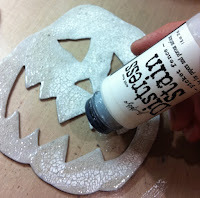 When Halloween meets Ideaology you get Spook-ology! 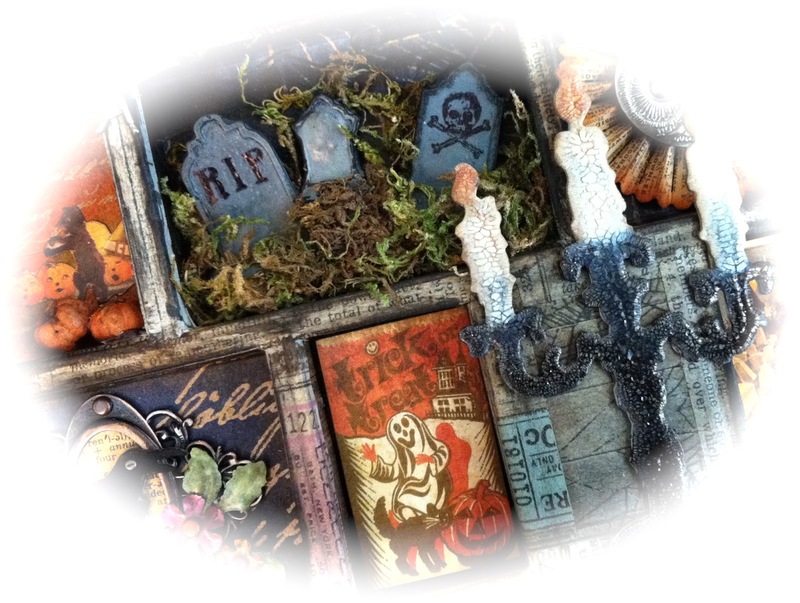 Take a creative journey and make this amazing Type Tray. 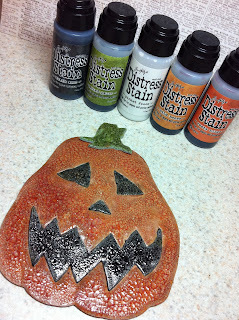 Learn techniques with Distress Stain, Alcohol Inks, Distress Crackle Paints and more. 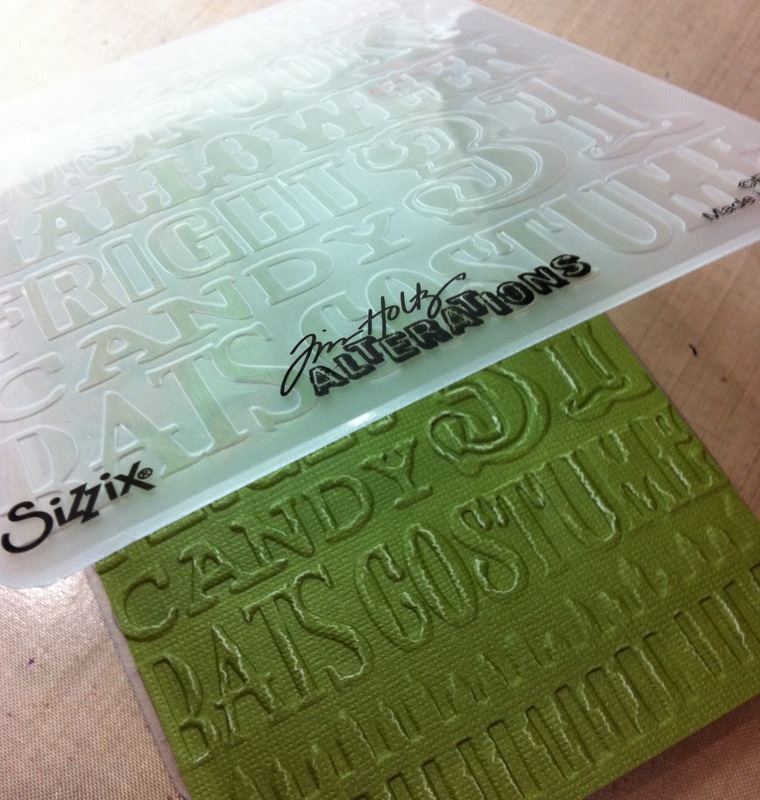 Everything for this project will be included and I mean everything, even halloween treats! 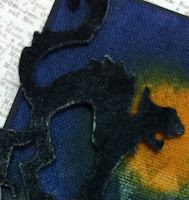 Here is a few sneak peeks of the project. 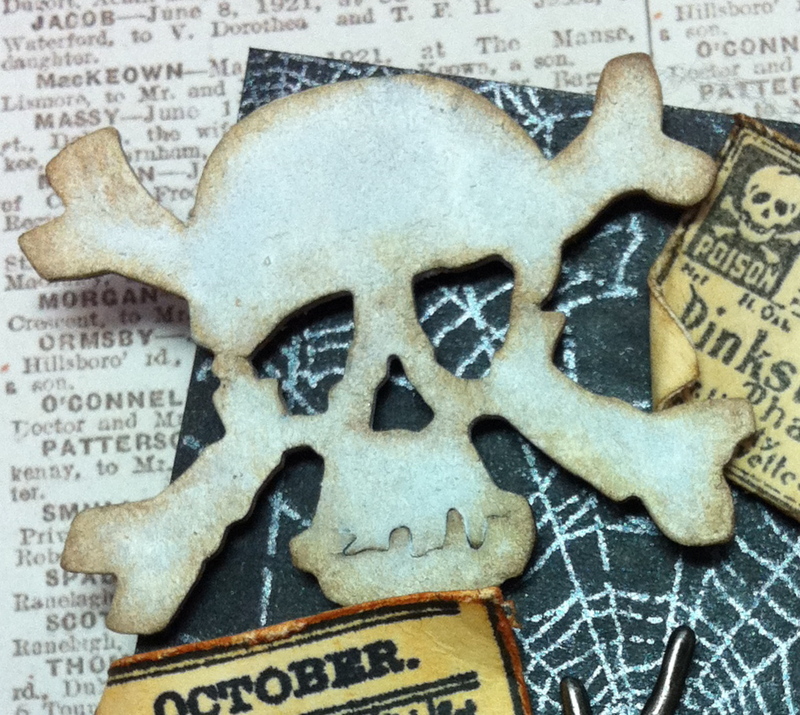 October 15th at Scrapbook Territory in Berkeley, California. 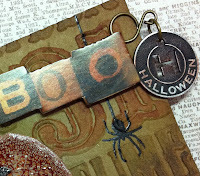 I've been so inspired by all the new Tim Holtz Halloween release I just had to make some more projects! 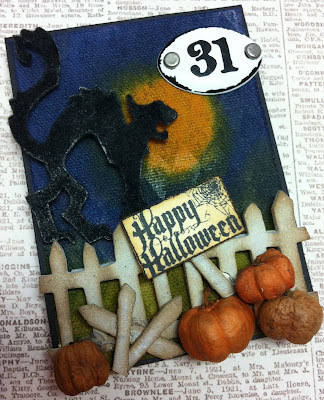 This ATC was made with grunge board die cuts using dies from the Alterations line (Mini Cat On the Fence). I started with a natural canvas ATC from Ranger's Inkssentials surfaces line, colored with Distress Stain then glued all the elements down. 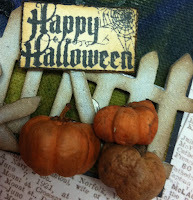 The fence was colored with Picket Fence Distress Stain and Distressed with an ink blending tool and Vintage Photo Ink. The cat has been flocked to make it look like fur. 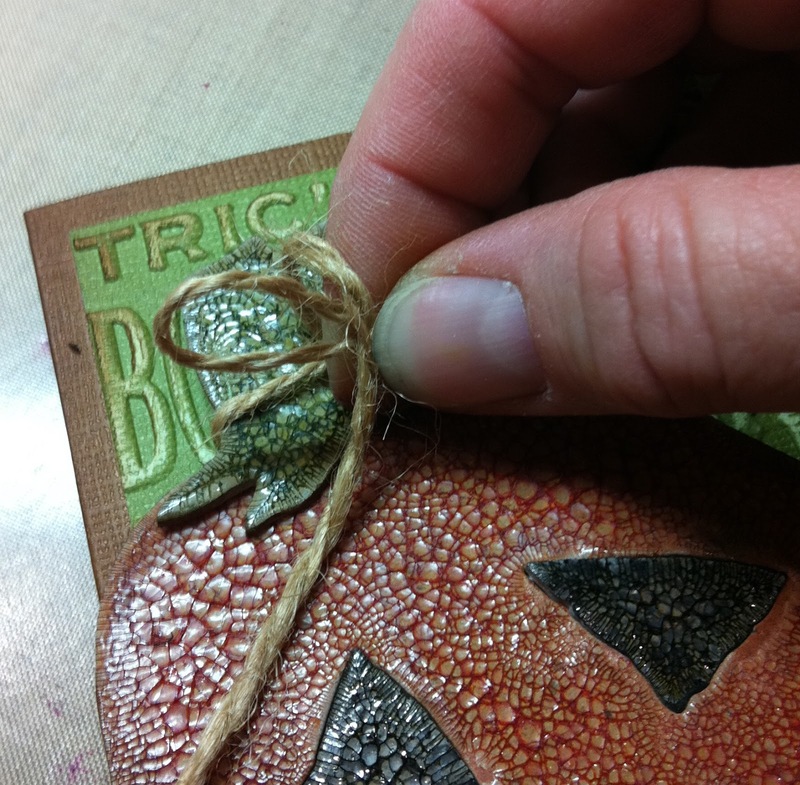 Aren't these little pods perfect for pumpkins in front of the fence. 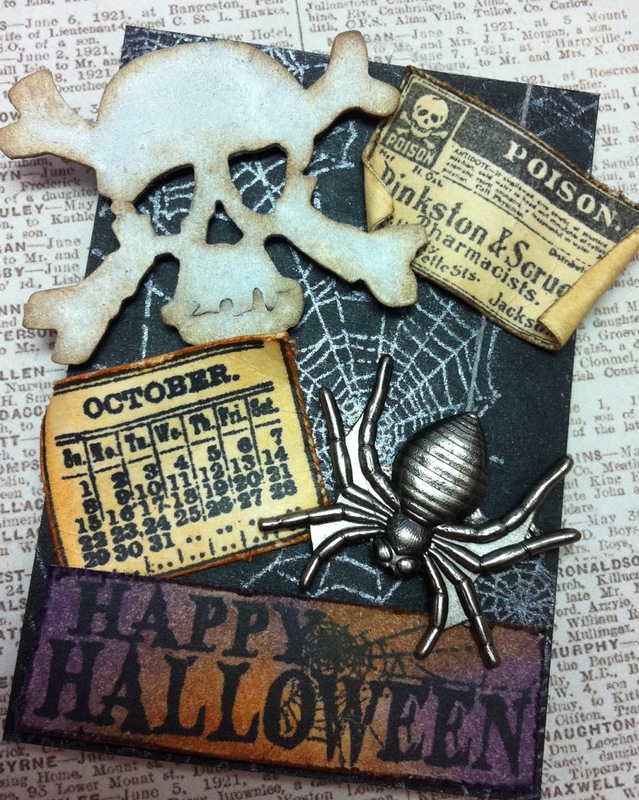 This spooky ATC starts with a black ATC and then stamped using Perfect Medium and powdered with Pewter Perfect Pearls. Happy Halloween, Calendar and Poison label are all stamped with pitch black Archival ink and then Distressed with Ink on your Ink Blending Tool. The mini skull die cut is a perfect size for cards, ATC, and the Configuration boxes. The Spider is from the Halloween Adornment set. 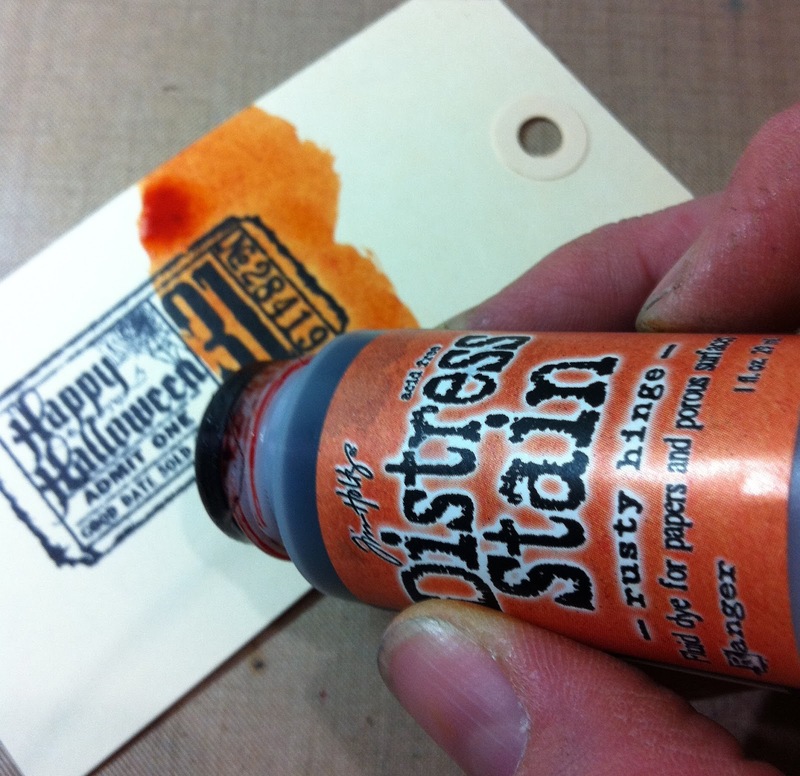 Stamp the Halloween background image using various colors of Distress Stain. I spritz the image with a little water before stamping it onto a Kraft ATC. Now stamp the spider and bats with Archival Ink. 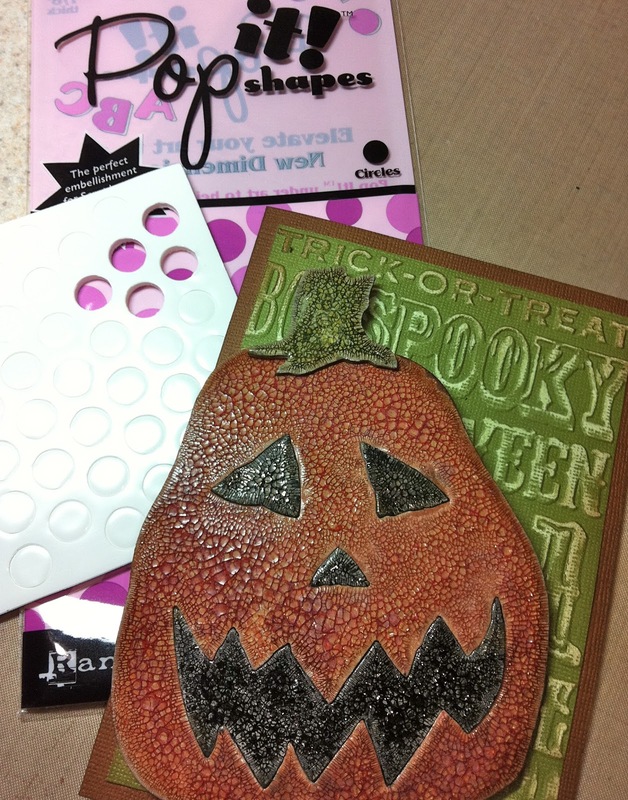 Emboss the stamped image with the matching embossing folder. It's so amazing how it just lines right up. Ingenious! 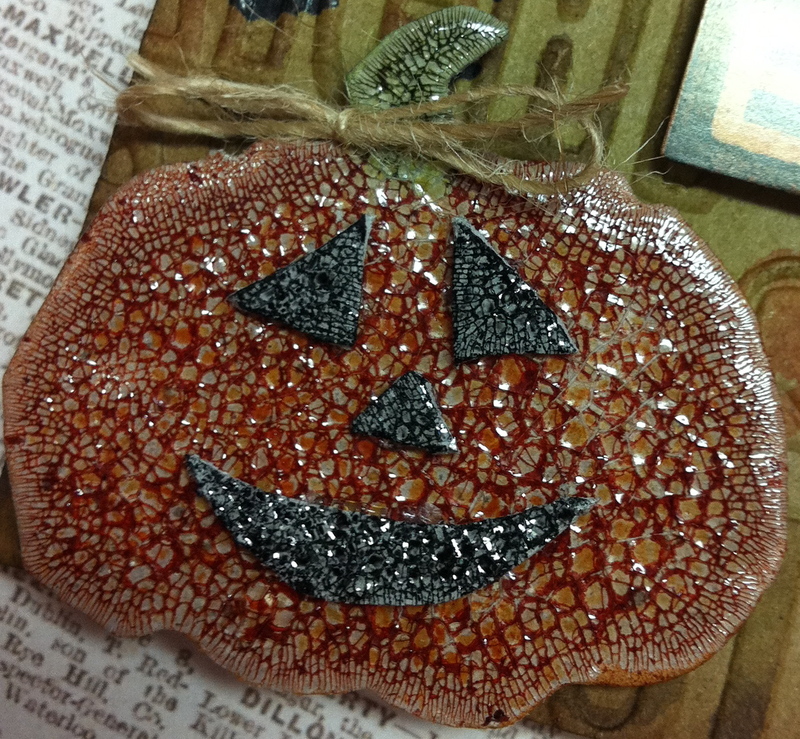 Pumpkin die cut has been painted with Rock Candy crackle and after it's dry color pumpkin with Rusty Hinge Distress Stain. The eye, nose and mouth where done the same way using Black Soot Stain. The BOO is a Salvage sticker from the Seasonal pack. 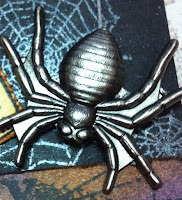 Use a Charm Clip to attach this Muse Token. I know it's not Halloween yet, but I do think it's my favorite holiday. Stampers Corner this week and just couldn't wait to use them on a project. 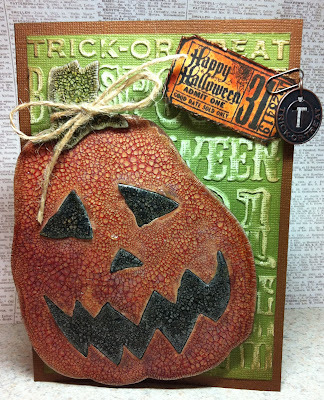 Grunge Board, Rock Candy Crackle Paint, Alteration by Sizzix (Pumpkin Jack, Scary Jack-o-lantern face set, Halloween Background and border texture fade) Core'dinations Distress Cardstock, Manila Tag, Distress Stains (Picket Fence, Wild Honey, Rusty Hinge, Peeled Paint, Black Soot) Distress Ink (Vintage Photo) Archival Ink (Pitch Black) Idea-ology (Mini Pins, Halloween Tokens, Jump Rings) Paper Distressor, Inkssentials Pop-It Shapes, Twine! 1. 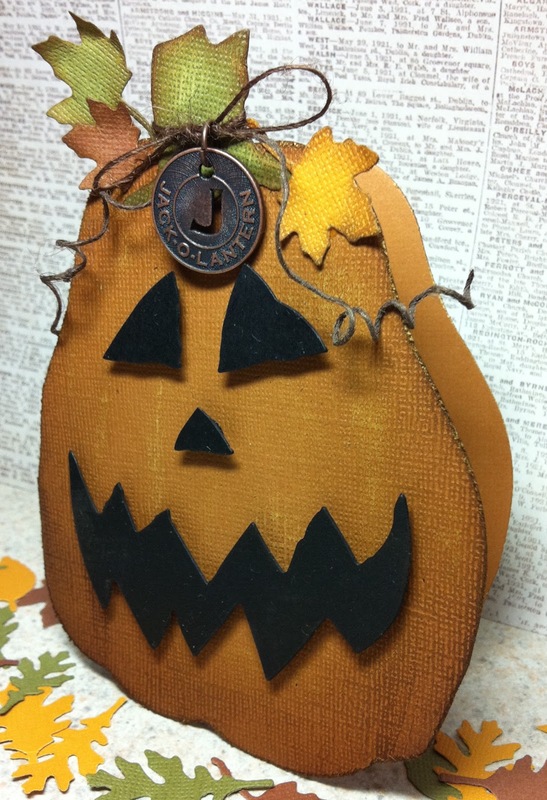 Die cut pumpkin from grunge board. 2. Glue dot pumpkin and parts to a scrap of paper. 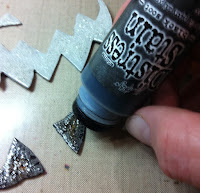 Paint all elements with Rock Candy Crackle Paint and let dry. 3. Shake Pickett Fence Stain. 4. 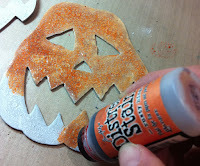 Paint pumpkin and let dry. 5. Paint pumpkin with Rusty Hinge Stain. 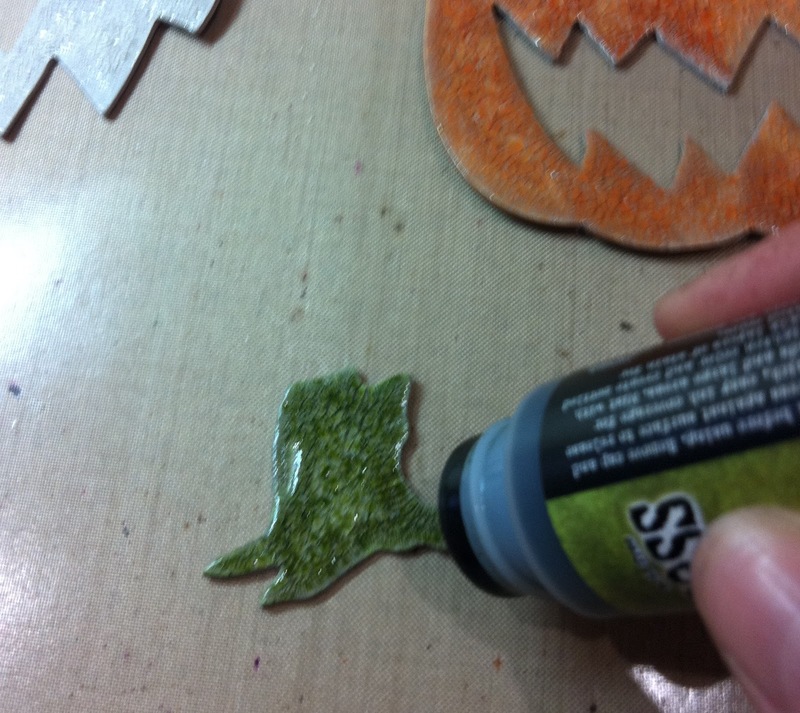 This may take 2 coats. 6. 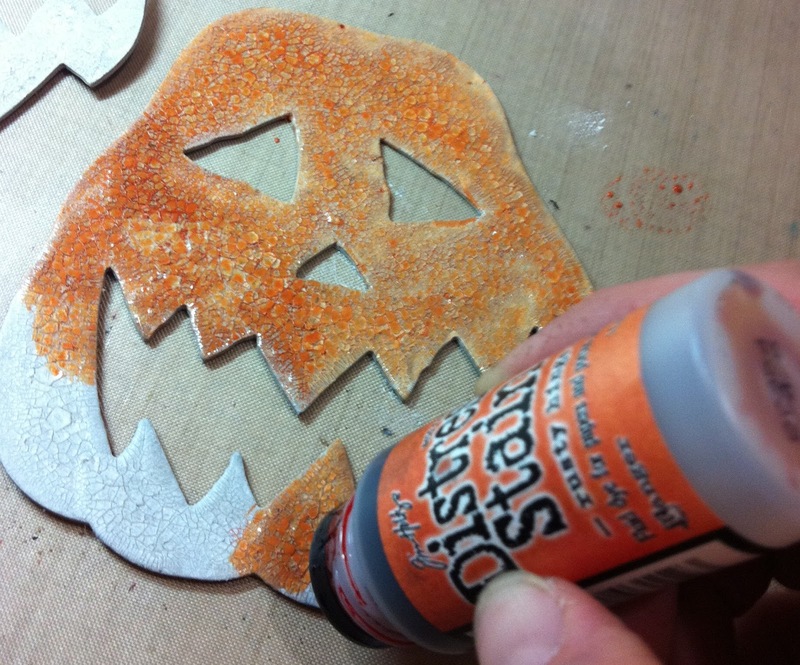 Paint the stem with Peeled Paint Stain and the eyes with Black Soot Stain. 8. 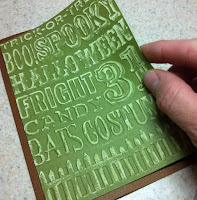 Cut cardstock to 4 1/4" x 6". 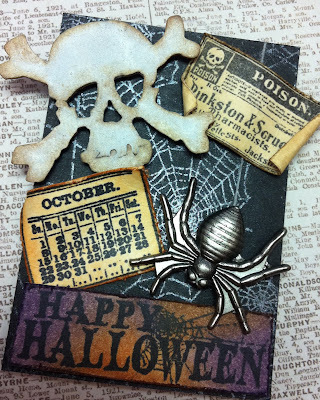 Now emboss with your new Halloween folder. Tip: To get this effect you must use a cardstock with a lighter core. I used Tim's Core'dinations Cardstock. 9. Sand the raised area to reveal the core. 10. 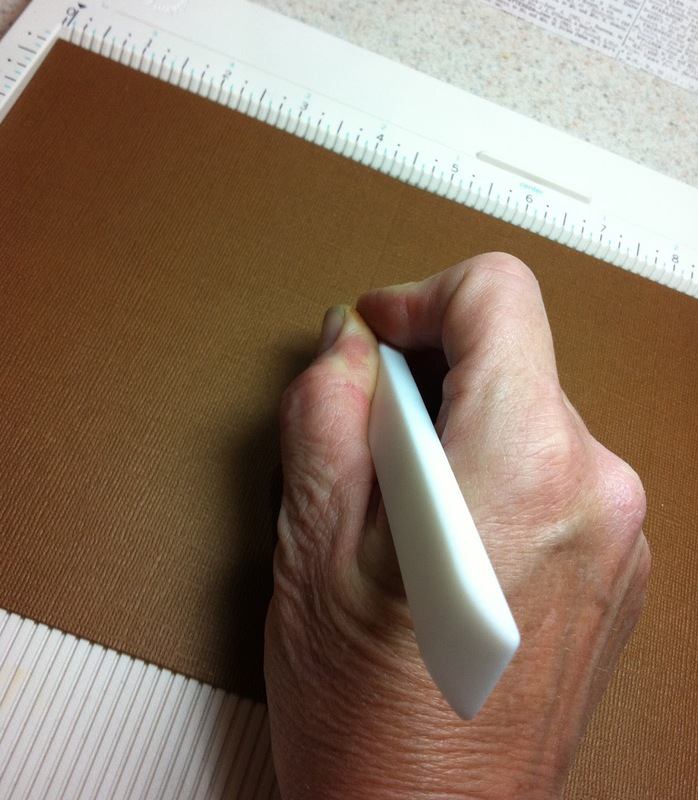 Cut cardstock to 9" x 6 1/4" and score in half. 11. Adhere embossed piece to your folded card. 12. Pop dot the pumpkin to your card. 13. 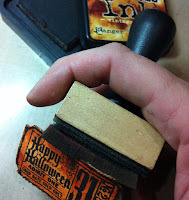 Stamp Halloween ticket on a manila tag with Archival ink. 14. Color with Wild Honey Stain. 15. 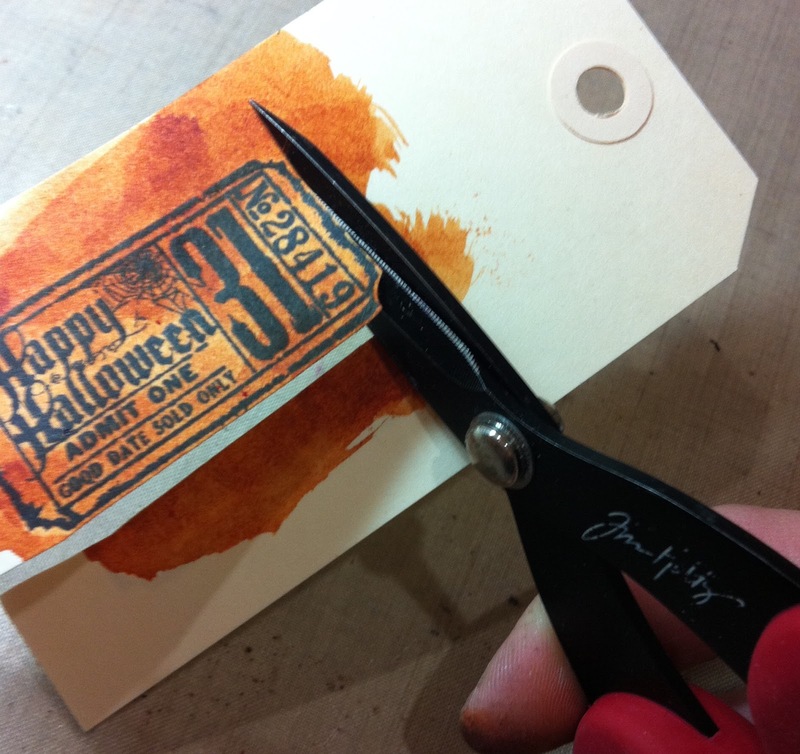 Cut out ticket. 16. 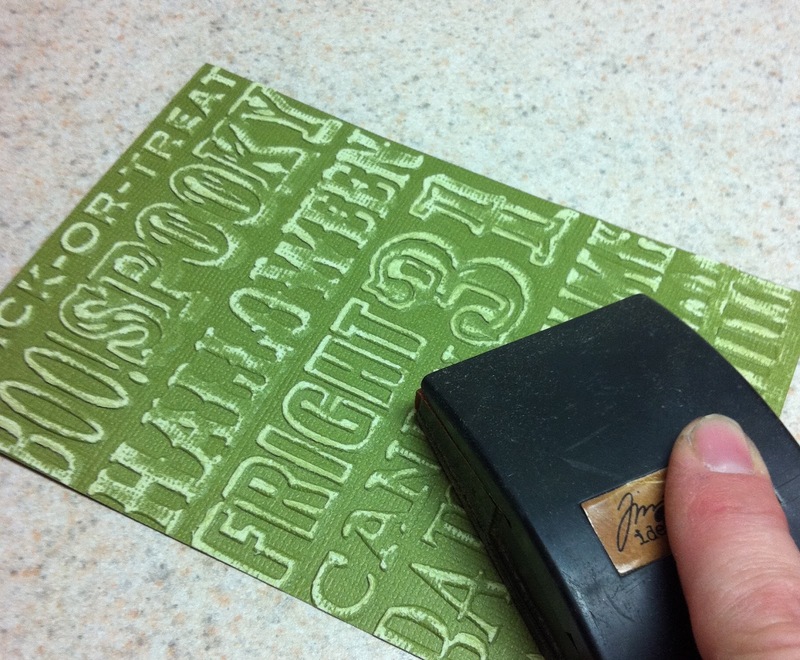 Use Paper Distessor on all edges of ticket. 17. 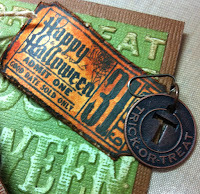 With an Ink Blending Tool, distress edges of the ticket with Vintage Photo Distress Ink. 18. Attach ticket with a Mini Pin. 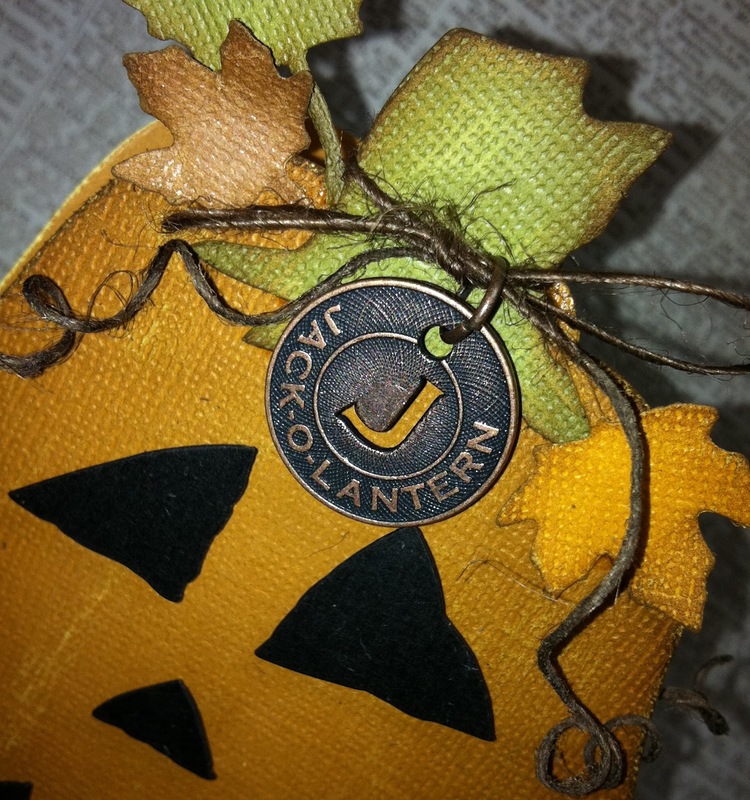 Add the Token with a Jump Ring. 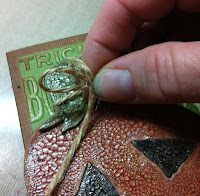 Tie a bow with twine around the pumpkins stem. 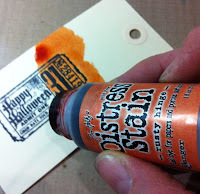 If you'd like to know more about Distress Stain check out Tim's video here! 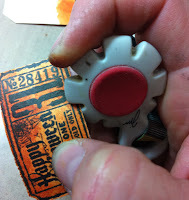 This is the same die cut with a different spin. Just simple die cut the pumpkin from a folded card, but be sure to leave a little of the fold in tact. 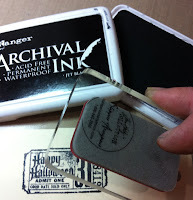 Distress the edges with a little Vintage Photo Distress ink. 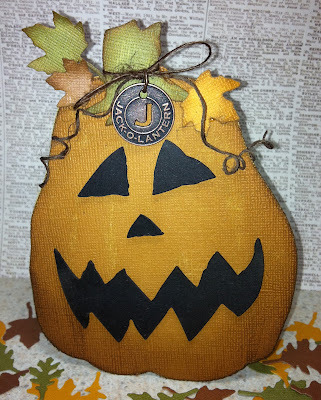 Pop dot the face to the pumpkin. 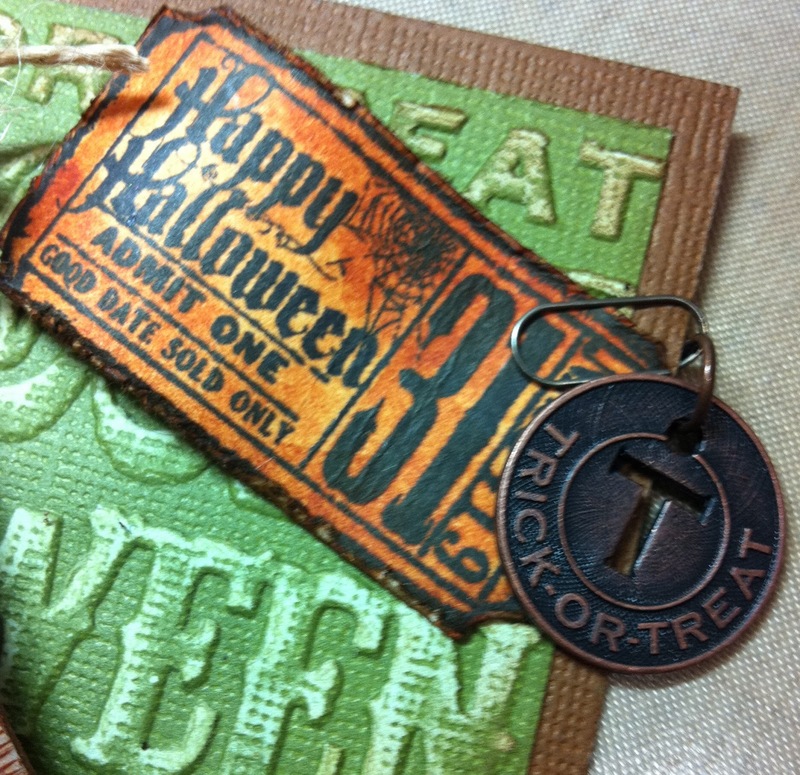 Tie a bow around the stem and attach the Halloween token with a jump ring. The leave are die cut from the Autumn Gatherings Decorative Strip die, distressed with Vintage Photo Ink and the glued around the stem. Yes it was 100 degrees here in Sacramento but FALL will be here before you know it! 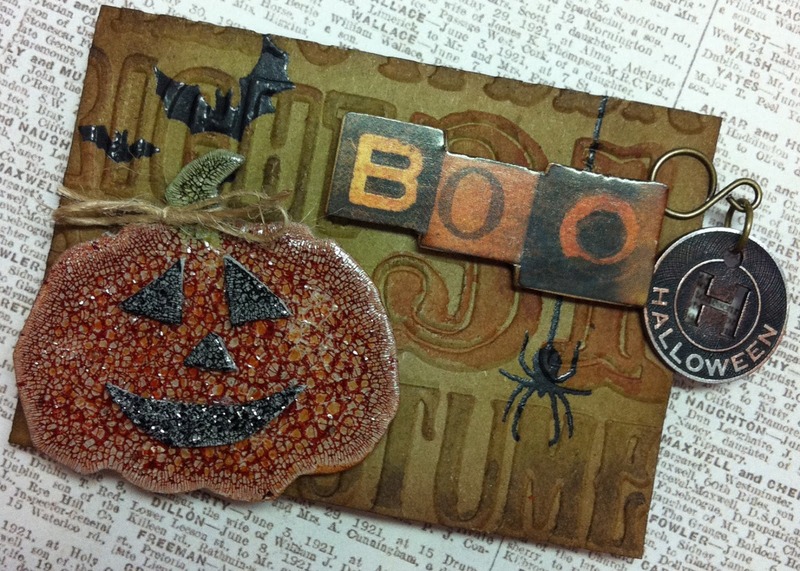 Art from the Heart Blog Hop! next weekend where the big birthday bash is happening. what an amazing project, and you are following the Tim Holtz team hop. I first covered the box with Crowded Attic paper stash and Symphony tissue tape, then colored the Tissue Tape with Distress Stain. You will notice that I put one of the boxes in upside down so I had a surface to glue the word "ART" onto. The word "ART" was made with Grunge Blocks, the base is painted with Pitch Black Dabber Paint and the letters are painted with Distress Stain, glue them all together and sand with Tim's Sanding Grip then use Vintage Photo Distress Ink on a Ink Blending Tool to distress the edges. 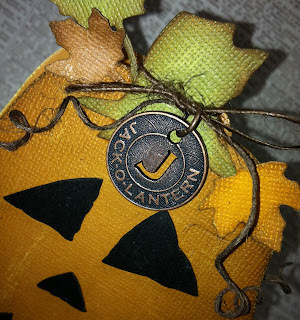 The candle is held on with a Hinge Clip that is bradded to the side of the box. 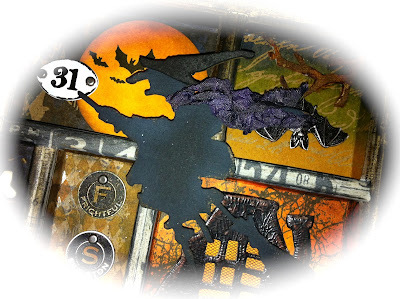 The "HAPPY BIRTHDAY" on top are letters from Salvage Stickers that have been placed onto a piece of Grunge Board and then cut out as you see them. Now just have fun decorating your birthday box! FRACTURED DOLL, GAME PIECES, TIMEPIECES, BAUBLES, GAME SPINNERS, SPROCKET GEARS, CLASSIC ADORNMENTS, FANCIFUL ACCOUTREMENTS, FOUNDATION FEET, CORNERS, HINGE CLIPS, LONG FASTENERS, CROWDED ATTIC PAPER STASH, LOST AND FOUND SALVAGE STICKER, ADAGE TICKETS, KRAFT GLASSINE, PLAIN GRUNGE BOARD, SYMPHONY TISSUE TAPE, 5 1/2" X 5 1/2" CONFIGURATION BOX, GRUNGE BLOCKS, BLACK DABBER PAINTS, DISTRESS STAINS (BARN DOOR, RUSTY HINGE, MUSTARD SEED, PEELED PAINT, BROKEN CHINA), VINTAGE PHOTO DISTRESS INK, AND A CANDLE FOR A VERY SPECIAL BIRTHDAY! 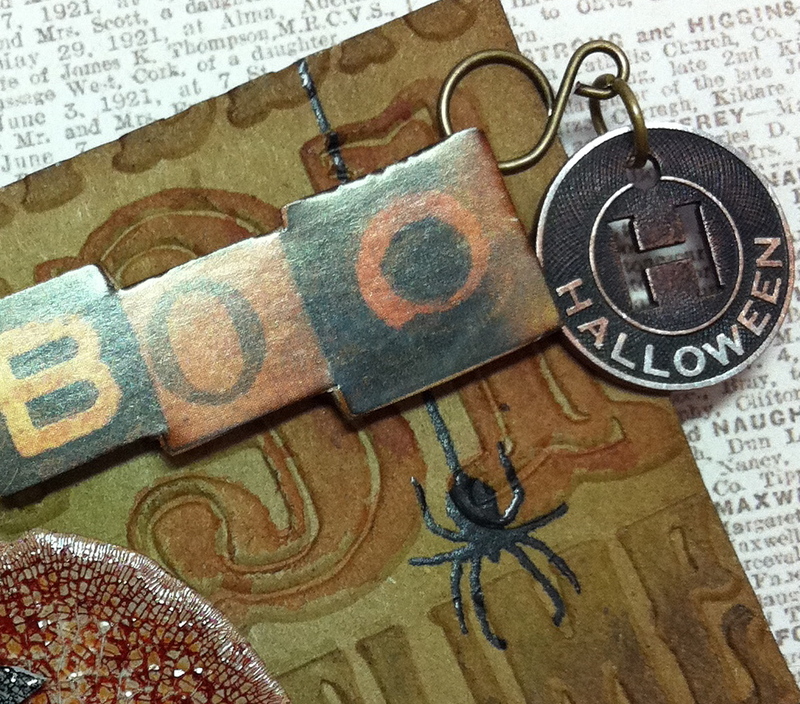 This is part of an anagram of a Tim Holtz product. 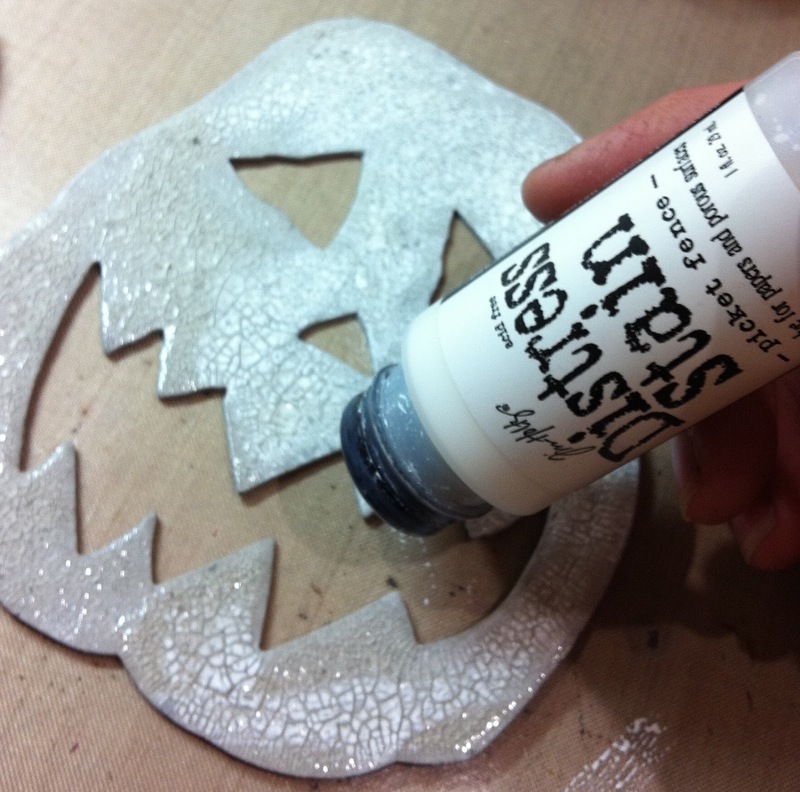 and see what fun project she planed for you. Happy Birthday to ART FROM THE HEART! Thanks for being a big part of ART. We all need ART for our HEART and SOUL'S! Thanks for stoping by and have fun on the hop! I have a few new projects on the RANGER website. Find out how they were made. 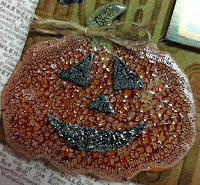 "Dreaming of Flowers" Tag features Rock Candy Crackle Paint. "Friends ATC" features Shrink Plastic colored with Alcohol Inks. 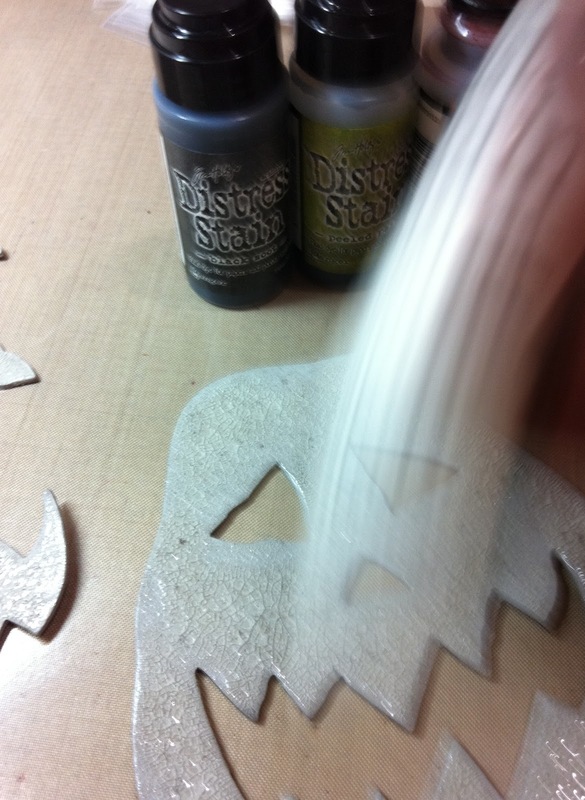 Click HERE for step out photos and directions. "Art from the Heart's" 10th Birthday. My project will be using Tim Holtz products. Surprising I know!